As a pool and spa expert I have heard every variation of this question from concerned pool owners looking to operate their pools without chlorine. Having a "chlorine free pool" sounds like a healthy, chemical free alternative to traditional chlorine sanitizer in pools. It is very understandable that people should be concerned for their health, and one does not have to look too far to find reports highlighting chlorine exposure as a potential concern. Chlorine sounds bad, and sounds like the type of chemical that you would NOT want to swim in, but the reality is that this is a misconception. If chlorine is so dangerous, and harmful, and potentially an exposure hazard, then why does drinking water have chlorine in it? Drinking water has been sanitized with chlorine for over 100 years. Salt has chlorine in it, as does many forms of plastics manufacturing such as with PVC. If chlorine is so dangerous then why is it in so many of the products that we use on a daily basis - most importantly things we ingest such as water! When a pool owner asks me about running their pool without chlorine my reaction is always the same...I can help you accomplish what you are trying to do, but first we need to take a step backwards so that I can teach you how to ask the right questions. Can you run a pool without chlorine? Sure, and it will probably look just like this great "chlorine free pool" you see pictured to the right. Does that look like something that you want to swim in? No, I didn't think so. You might be thinking that this is a picture of a neglected pool, which it is, but the point stands. Chlorine is used in pools for a very specific, very important reason. Four reasons actually. These four incredibly important features are what are required in order to maintain a safe and bacteria free pool. When you start to look towards alternatives to chlorine, it is this list that you need to be aware of. Chlorine is one of the very, very few chemicals that meet all of these criteria, and yet is still "safe" in the levels that you are exposed to. Without these four qualities, there is significant risk for nasty stuff to grow in the water and potentially make you sick. What Happens If You Don't Use Chlorine In Your Pool? 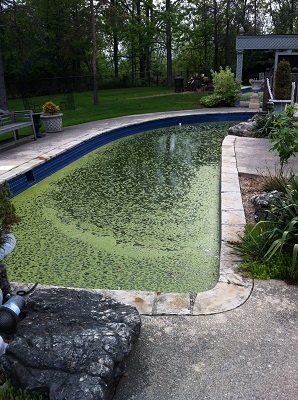 You want to operate your pool without chlorine because it is more healthy...right? When you consider what can happen when you don't use chlorine to sanitize the water in your pool you might start to second guess how healthy a chlorine free pool actually is. First, without the 4 levels of protection in your water, you open the door to the potential for a serious problem. The reality is that stagnant water that is not sanitized can host all kinds of terrible, unseen dangers. This does not mean that every untreated body of water will kill you. You could probably go outside and find a puddle and drink the water right out of it. Other than being incredibly disgusting, most likely you will not die from doing it. That being said, if it were common place for all people everywhere to drink out of filthy puddles, then filthy puddle water would be one of the leading causes of mortality in the world. Actually, sadly, lack of clean drinking water IS one of the worlds leading causes of death. One out of every five hospital beds in the world has someone in it that is sick from a water related illness. Swimming in a pool without chlorine will probably not kill you. You will probably not develop a bacteria that attacks your brain, and you will probably not develop flesh eating bacteria that results in death or major loss of limbs. Probably. Of course, if everyone started swimming in pools without chlorine then brain-eating bacteria and flesh eating diseases would become much more common. Is chlorine really all that bad? At 1 part per million you can completely remove any potential for brain eating bacteria from your pool. That sounds like a down-right bargain if you ask me. So if having a chlorine free pool is so dangerous then why do so many people want to figure out how to run their pool without chlorine completely? The answer is simple - they are either under informed or misinformed. Chlorine is the lesser of the two evils when it comes to keeping swimming water safe. I would not go so far as to say that swimming in chlorinated water is healthy for you...but I would say that it is MUCH healthier than swimming in water that is not protected by a chemical sanitizer. So are there any actual replacements for chlorine sanitizer? Yes, there are a few notable ones. The most common one that you already know about is bromine which is the most common sanitizer of choice in hot tubs, and to a much lesser degree, swimming pools. While bromine is very similar to chlorine, and can meet all four required characteristics needed of a chemical sanitizer in a pool or spa, the cost of bromine is the main reason it is not used more than chlorine. Both chlorine and bromine essentially do the same thing in the water but since bromine is far more expensive than chlorine, it is less popular. Also, is bromine any more healthy than chlorine? Probably not. If you are looking for alternatives to chlorine, bromine is probably the best option, but unlikely to actually accomplish what you are trying to do. When you talk about alternatives to chlorine sanitizer one of the lesser common options is Baquacil sanitizer . Baquacil is different than chlorine or bromine sanitizers in that it works as an oxidizer primarily. The significance of this is that an oxidizer typically meets three of the four important criteria to make the water safe. Baquacil is an oxidizer product, but one that is able to maintain a residual value. This is unique as oxidizers typically can not hold a residual value which is why using an oxidizer as a stand alone solution is not approved for swimming pool water maintenance. The use of Baquacil as a sanitizer in pools is a hotly contested topic within the pool industry. Biguanide is the chemical compound that the Baquacil product is based on and another brand based on the same organic compound is Aqua Silk . While it is accepted and used in residential pools, Baquacil is not approved as a chemical sanitizer solution in commercial swimming pool facilities. The concern is that while Baquacil promotes the ability to maintain an oxidizer residual in the water, the potential for periods of time with no oxidizer available are too great. Another concern for biguanide based pool care is that the pool water can develop a white mold due to a resistance to the biguanide compound. 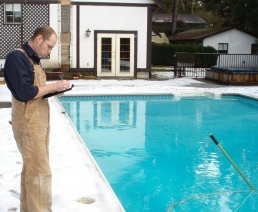 A typical experience from a biguanide maintained pool would be clear and clean water in the first year, but increased difficulty maintaining water clarity and safety the longer that it is in use. It is common for biguanide users to periodically switch back to chlorine for a season every five to seven years. The alternative is to drain and replace your pool water completely every few seasons which is not ideal for the pool or for your water bill. Oxidizers can potentially replace chemical sanitizers however the problem remains that oxidizers are not able to adequately hold a residual value in the water. This is where the question of a chlorine free pool starts to get complicated. There are, in fact, many examples of swimming pools that operate without any chlorine. There are even examples of public swimming pools that operate like this such as one that was completed in 2008 in Munich Germany, Naturbad Maria-Einsiedel. This is a public pool that operates completely without chlorine. Perfect - this is exactly what you have been looking for, right? Not so fast. While the technology to do something likes this is just starting to become a reality, this is a far cry from being able to implement this in the average backyard swimming pool. In this instance of the natural, chlorine free public pool in Germany, the pool was purpose built and engineered specifically to be a natural pool. This is not an alteration that you can make to your existing pool. It is also worth noting that the people who maintain the water quality of this public pool wear lab coats to work, and very likely have advanced education including engineering and chemical sciences degrees. 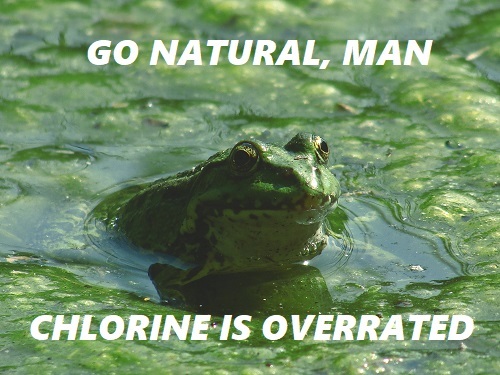 Thinking that you can just stop adding chlorine to your backyard pool and achieve a natural pool would be a silly mistake at best, or a tragic, sad story at worst. At this time the technology does not exist to operate your backyard pool safely without a chemical sanitizer. If you are asking about how to have a "chlorine free pool" then most likely you have not yet done the research you need to do. You need to understand that it is for your own safety, and for the safety of anyone in or around your pool, that you need to use a chemical sanitizer. It is understandable that you would prefer a chemical free pool but this is far more insidious of a statement than you likely realize. Your only line of defense against things far more dangerous than chlorine is your chemical sanitizer. Without it you have an elevated risk for illness or even death. Unless you have a cutting edge technology pool that has been purpose built to be a natural pool, then the absolute best that you can hope to do to reduce your chemical exposure is to heavily oxidize your pool while maintaining minimal safe chlorine levels. The reality is that with the proper addition of peripheral equipment, and chemical dosing with oxidizers instead of chlorine, you can achieve a pool that is almost chlorine free. This is the best of both worlds as it accomplishes your goal of reducing your exposure to harmful chemicals, without completely forgoing the line of protection that chemical sanitizers provide. There are also other options that you can consider for your pool that are not suitable as a stand alone chemical treatment, but when used to supplement your chlorine, can vastly reduce the amount of chlorine that you need. If you are looking for ways to reduce the amount of chlorine that you use in your pool then one of the options is to use mineral sanitizers like the Nature2 system. The "minerals" are actually copper and silver. Copper ions and colloidal silver are both known for their abilities to prevent algae and bacteria and in a swimming pool these minerals will definitely reduce the amount of chlorine that you need to use. You just need to decide whether copper and silver in your pool water is any better than chlorine. Still, in a world where many products do not actually do what they claim, the Nature2 system is not one of them. These systems do make a noticeable difference, however you need to buy a Nature2 replacement cartridge every year. Other than dosing with oxidizers, or potentially adding a mineral dispenser to your pool system, the only other ways to reduce your chlorine exposure is to install peripheral hardware on your pool system. UV and ozone generators are the two best options if you want to reduce the amount of chlorine you use in your pool. Again, they are not suitable to use as a stand alone solution, but when used in conjunction with minimal chlorine levels you can drastically reduce the total amount of chlorine that you need. Wanting to reduce your chlorine exposure is a great idea. There are a number of different peripheral components that you can add to your pool to accomplish this. When you start to add equipment like UV or ozone generation systems you can dramatically reduce the total amount of chlorine that you use. A 90% reduction of the amount of chlorine that you use in a year is entirely possible, and a much better idea than trying to run your pool completely chlorine free. The limitation of systems such as ozone and UV is that they do not hold a residual value in the water. Any contaminants in the water will not be effected by the UV light or ozone generator until it passes through the filtration system. This is why chlorine is needed. You can rely on the peripheral equipment to do the heavy lifting, so to speak, and let the chlorine kill anything that is free floating in the water. A UV light is an effective way to oxidize bacteria in swimming pool water. The technology is so effective that it is law in most areas for public splash pads, a very high risk environment for bacteria, to use UV technology in addition to chlorine. These systems require periodic lamp replacement, and they will experience reduced effectiveness as they age. If you are serious about reducing your chlorine exposure in your pool then a UV light is probably the best choice you can make. UV can be used on almost every type of pool and adapts easily to existing systems. Ozone generators have the potential to be equally as effective as UV with the one exception being that ozone needs to have a longer contact time with the water to be effective. Water passing by the UV lamp will be effectively oxidized however an ozone generator works by introducing ozone bubbles into the pool system. The effectiveness of the ozone is directly proportional to the contact time with the water. This is why ozone systems are best when designed into the pool from the beginning. Ideally you want to have a return that goes to the bottom of the deep end of the pool as this will allow the longest amount of contact time with the water for the ozone to be effective. This will also allow the ozone to be introduced in an area of the pool where it is unlikely to cause staining (oxidizing) of pool surfaces. A mixing tank can also be used to help increase the contact time with the water as well as allow the ozone to off-gas before being returned to the pool. If you want to know more about how ozone works as well as see a review of every brand of pool ozone system then you can read this article on ozone reviews. The reality of reliably safe chlorine free pools is not something that currently exists. If you learn how to properly manage your water chemistry, as well as use the methods outlined in this article, you will be able to reduce the amount of chlorine that you use by more than half. With dedicated maintenance and some advanced hardware like a UV system then it is reasonable to think that you can reduce your total chlorine use by as much as 90%. If you need to brush up on your water chemistry then you might benefit from the simplified water chemistry crash course article. Do pools really need chlorine?